The principal investigator for each study is Dawit Aregawi, MD. Please contact Dr. Aregawi at daregawi@hmc.psu.edu for more information. 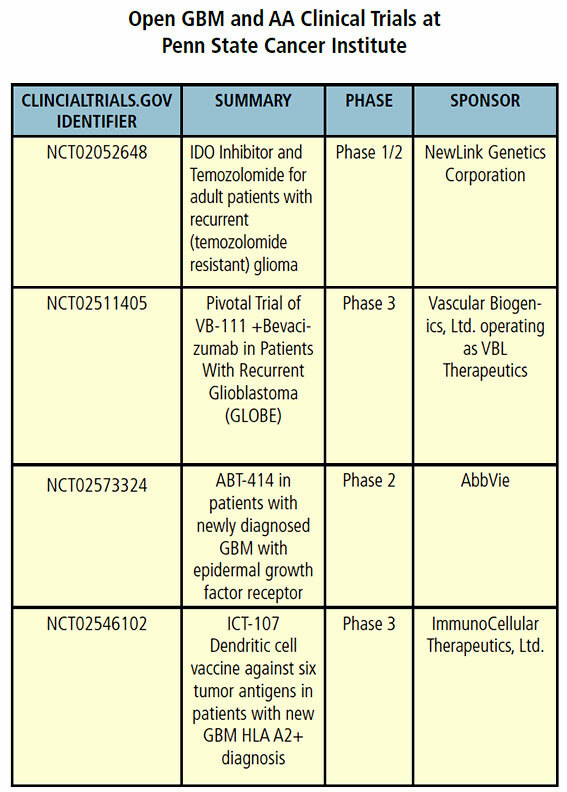 A second promising pipeline candidate is Toca-511/FC (Tocagen, Inc.) for the treatment of new or recurrent GBM or AA. Toca-511/FC comprises a two-step treatment regimen following tumor resection. The first component, Toca-511, utilizes retroviral replicating vectors (RRVs) injected at the time of surgery designed to selectively deliver therapeutic genes to dividing cancer cells, which then spread to neighboring cancer cells. In this case, the Toca-511 RRV infects remaining cancer cells and causes them to express cytosine deaminase (CD). The patient then receives the second treatment component, the antibiotic 5-fluorocytosine (5-FC). In infected cells, CD converts 5-FC to the anti-cancer drug 5-fluorouracil (5-FU), hopefully leading to selective tumor cell death. Recruitment in trials of Toca-511/FC for newly diagnosed GBM (Phase 1: NCT02598011) or recurrent GBM (Phase II/III: NCT02414165) is expected to begin sometime in 2016. FELLOWSHIP: Neurosurgical Oncology, Memorial Sloan Kettering Cancer Center, New York, N.Y.
RESIDENCY: Neurological Surgery, New York Presbyterian Hospital – Columbia University, New York, N.Y.
MEDICAL SCHOOL: Columbia University College of Physicians & Surgeons, New York, N.Y.
Xiu J, Piccioni D, Juarez T, et al. 2016. Multi-platform molecular profiling of a large cohort of glioblastomas reveals potential therapeutic strategies. Oncotarget. Feb 25. Phuphanich S, Wheeler CJ, Rudnick JD, et al. 2013. Phase I trial of a multi-epitope-pulsed dendritic cell vaccine for patients with newly diagnosed glioblastoma. Cancer Immunol Immunother. Jan;62(1):125-35.